NPCS Board of Consultants & Engineers launch new book about disposable product and manufacturing handbook. It will helps every day life and also in business life. Everyday life products manufacturers worldwide produce a multitude of items that are intended for one use only. A disposable is a product designed for a single use after which it is recycled or is disposed as solid waste. The term often implies cheapness and short-term convenience rather than medium to long-term durability. The term is also sometimes used for products that may last several months distinguish from similar products that last indefinitely. For a manufacturer, to produce disposables is a good deal keeping in view the present demand and growth in the market. This handbook is a complete well to do package for a layman to understand the basic steps to be followed for setting up a plant for a particular disposable product. The book contains raw material details, product manufacturing process, machinery details, images with raw material and machinery suppliers. 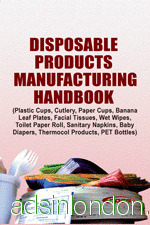 The Disposable Products Manufacturing Handbook is about producing Plastic Cups, Cutlery, Paper Cups, Banana Leaf Plates, Facial tissues, Wet Wipes, Toilet Paper Roll, Sanitary Napkins, Baby Diapers, Thermocol Products, PET Bottles that are used by masses in their day to day life. The book discusses the importance and objectives of processes and material used for the production of disposable products. Many examples have been provided to illustrate the concepts discussed.